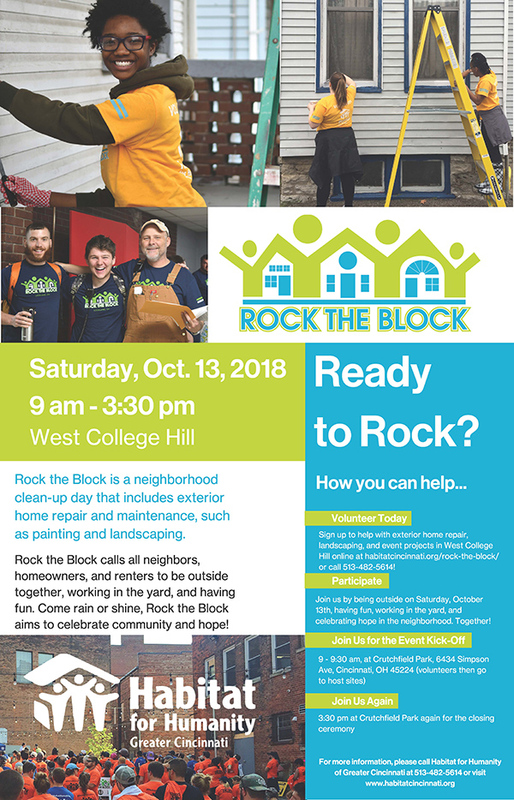 Rock the Block is coming to the Springfield Township neighborhood of West College Hill on Saturday, October 13, 2018 from 9:00 am - 3:30 p.m.! Rock the Block is a neighborhood clean-up day that includes exterior home repair and maintenance projects, such as painting and landscaping. Rock the Block calls all neighbors, homeowners and renters, to be outside together, working in the yard, and having fun. Rock the Block events serve as an extension of Habitat for Humanity's neighborhood revitalization efforts. The emphasis of this program is to help homeowners in neighborhoods where Habitat is active with minor exterior home repairs such as painting and landscaping. Interested homeowners in West College Hill should print and complete a Rock the Block application form. Completed applications can be mailed to HFHGC, 4910 Para Dr., Cincinnati, OH 45237. All Rock the Block applications must be received no later than 4pm on Friday, September 14th to be considered for the event. Applicants must be the homeowner, own a home in need of minor exterior repairs, income within 30% to 80% of the area median income, and willingness to serve alongside volunteers during the Rock the Block event on October 13, 2018. A onetime $20 fee will be collected from each eligible and approved applicant. While this year’s Rock the Block will serve up to fifteen selected exterior home repair host sites, all neighbors are encouraged to participate and volunteers are needed. Rock the Block calls all neighbors, homeowners and renters, to be outside together, working in the yard, maintaining their homes, and having fun. In addition to exterior home repair projects, volunteers will support a neighborhood trash pick-up effort. Up to four large dumpsters will be available for trash drop-off. Neighbors are welcome to use of the dumpsters for trash removal (dumpsters cannot accept large appliances, hazardous chemicals and tires). For more information, please contact Habitat at 513-482-5614. Rock the Block events serve as an extension of Habitat for Humanity’s neighborhood revitalization initiative. The emphasis of this program is to help homeowners in specific neighborhoods with minor exterior home repairs such as painting and landscaping. 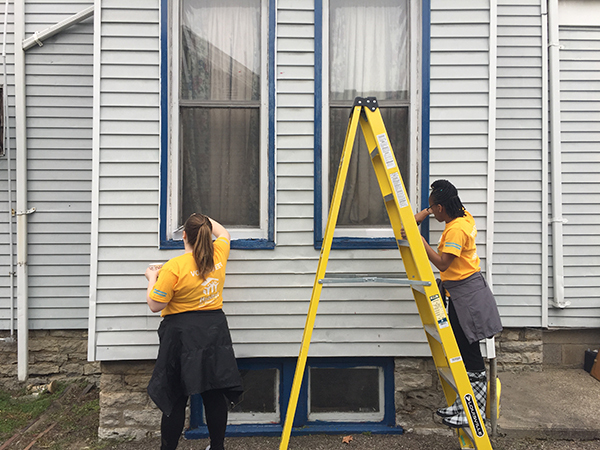 Habitat for Humanity is now seeking volunteers to help spearhead the exterior repair initiative. Join us in West College Hill, OH as we Rock the Block! Rock the Block calls all neighbors, homeowners and renters, to be outside together, working in the yard, and having fun! The event will focus on exterior home repair projects and street clean-up within the city limits of West College Hill, OH! Who: Young Professionals, College Students, Local Companies, Churches, Individuals, Friends, Neighbors, YOU! For any other questions, please contact Jennifer Kephart with Habitat for Humanity of Greater Cincinnati at 513-482-5644 or email at Jen.Kephart@habitatcincinnati.org.